The Steamer Peter Stuyvesant entered into service in the year of 1927. Built in Wilmington, Delaware. It was the first of propeller operated ship built by the line. Originally designed for charter and "moonlight" cruises, the Peter Stuyvesant ran from New York to Albany, with other scheduled services. This was to be the last of the Great Ships built for the Hudson River Day Line. Retiring it's long time service in the 1960s. It's final days the Peter Stuyvesant served as a restaurant in Boston. ​The Saugerties Public Library shares some extensive visual and interesting history about the Waterways of the area. We borrowed some history about The Saugerties. The page we borrowed from, is one of the More Interesting pages that we've come across. Shipwrecks of Saugerties. It's a Must to visit. Please credit the following text to Shipwrecks of Saugerties, and Visit to learn more history. "On the evening of Nov. 22, 1903, the steamer Saugerties caught fire and burned to the waterline at its dock on Esopus Creek. The fire started in the oil room and spread rapidly. By the time the village fire department arrived the vessel was enveloped in flames. One deckhand lost his life while trying to retrieve his clothes from the forecastle against orders to go ashore. Burned beyond repair, the ship was stripped of its fittings, and the charred hull was towed into the cove north of the lighthouse and scuttled. The wooden remains are submerged except............. "
in my opinion, this is probably one of the most Historical Places in Saugerties. I feel it should be preserved as such, including the re-construction of the Steamer Saugerties. Possibly finding some original pieces from her, that can be added within the building. What a Great place for a Museum, at least for the Nautical History of Saugerties. The following image shows us the exact location of the Saugerties Steamer. The two shore-side buildings, left facing, still stand Proudly today. 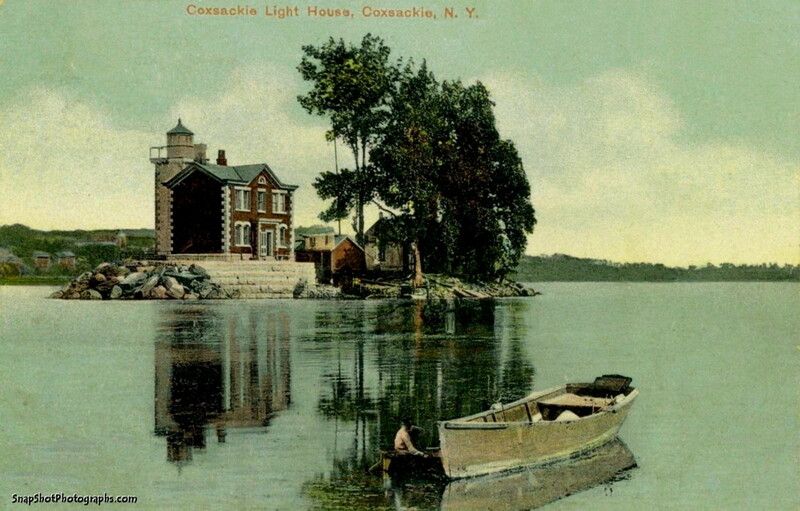 as viewed from across the Esopus on Lighthouse Drive. This would be the Exact Spot the Photographer was standing when the shutter clicked. Possibly a few feet closer to the creek. If we look closely, through the trees, we can see the buildings. One of which, has a Coca-Cola machine alongside of it. ​That Bright Red Machine, gave me the correct angle of placement. 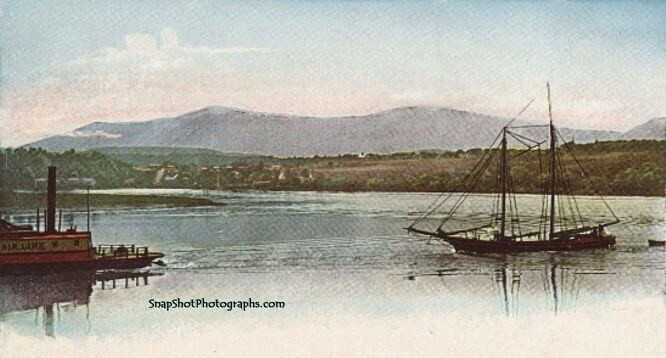 The above photograph, shows the Saugerties Steamer where She Burned and Sunk in the Lower Esopus. Shared by Michael Sullivan Smith of I Like Saugerties Facebook, and the Photo belongs to the Saugerties Public Library. This next image took some time to find. When we finally found the location of this photograph illustration, we then noticed the Rip Van Winkle Bridge in the background. Looking closely, you can clearly see it. So this Now & Then Fade is just about right on where the photograph was originally taken. Most of these old views, were rendered by the photograph, so postal cards could be produced at a cheaper cost. We cruised the Hudson River at this area for an hour or more, and Yes, at certain points, the mountain horizon matches. We have limited abilities when using the Google map, especially when on the river. In the year of 1859, The Ferry, "Air Line"
began crossing the Hudson between Saugerties and Tivoli, N.Y.
"The Reindeer, among others, was an Albany-New York Ferry which became part of Saugerties history on an otherwise bucolic Saturday." "…We are called upon to record a fearful calamity on the waters of our placid Hudson. The steam boiler flue of the Reindeer exploded on Saturday noon, as she was about leaving the Malden… landing, instantly killing several persons, blowing others overboard, some of whom were drowned, badly scalding many others, and inflicting alighter [sic.] injuries upon an additional number…4"
Please give image, history and text credits to The Saugerties Public Library. In 1899, Eben Erskine Olcott, built the New York and Albany, which carried more than 230,000 passengers. A new steamboat for a new century, she began carrying passengers in 1906. She was capable of carrying 5,500 passengers. ​"The Hendrick Hudson was put into service in 1906 at a cost of almost a million dollars. She had an advertised length of over 400 feet and was licensed to carry 5,500 passengers. Art was commissioned for interior decoration. Murals depicting Henry Hudson's Halve Maene, Washington Irving's home, the senate house at Kingston, and the capitol at Albany were part of the interior displays." Please credit all text and visit this site to learn more about Steamboats on the Hudson by Clicking This Line. "This educational video provides a bird's eye view of the lower Esopus from its meeting with the Hudson river in Saugerties, NY, to its beginning at the Ashokan Reservoir." The Hendrick Hudson Steam Liner, began carrying passengers in 1906. The Catskill & Albany Exursion Steamer, Ursula, is said to have had a most beautiful power propeller. Which the Ursula was Well Known for. This boat made her last trips in 1913, and in 1914 - Just a short time before of this image. "In 1878 the New Baltimore shipyards turned out a little ferry named the COXSACKIE, delivered it to William H. Thomas, her owner, in the village of the same name, and went back to its duties of constructing barges, propellers, and occasionally a yacht or two." "Coxsackie’s ferry, the W. V. B. HEERMANCE, was tired and old, and the spanking new COXSACKIE was built especially to replace her. The HEERMANCE was tied at the dock and held for a time as an extra boat, but she never ran again." This following moment captured, I just had to borrow from SaugertiesLighthouse.com to put on the map. Mr. Chester Glunt is hard at work in early Spring, breaking ice. Can you imagine having this job? We may not be in the exact location, but never the less, close, and we know where ice needed to be broken, Chester was there to break and clear the way. "Construction began in early 1873. Pilings were driven some fifty feet into the riverbed and then surrounded by a granite pier. The keeper's dwelling was then constructed on top of the man-made pier. The north end of the lighthouse base was designed like a bow of a ship. This was done to protect the lighthouse from the frequent ice flows in winter and spring. Built in the Second Empire architectural style, the two story brick and granite structure sits majestically in the middle of the river between Hudson and Athens. The lighthouse was put into operation on November 14, 1874 with Henry D. Best as its first keeper and automated on November 10, 1949 almost seventy-five years to the date on which it was first lighted. Today, the lighthouse still serves as an aid to navigation, guiding ships safely around the Middle Ground Flats." Always researching history. Sometimes coming across some very interesting websites that contain history. The sites that I feel are worthy of sharing, I will Gladly. Any link below this line, is without doubt, Worthy of a Visit. "The lighthouse was first established in 1830 and the last tower was first lit in 1868. The lighthouse was deactivated in 1940. The lighthouse was a red square tower with granite trimmings and a red dwelling on stone pier. The lantern housing was black. The light was 32 feet high fixed white light. The original lens was a sixth order Fresnel lens." "Mayor William R. Grace (who would later serve as president of the Grant Monument Association) offered to set aside land in one of New York City's parks for burial, and the Grant family chose Riverside Park after declining the possibility of Central Park. Riverside Park included one of the highest points of elevation in Manhattan overlooking the Hudson River. The park was in its formative years at the time, and it was believed that the tomb would stand as a central theme for future park development." Please credit and read more here about this Historical New York Landmark by Clicking this line. "North River Blue Stone Works of John Maxwell and the Bigelow Blue Stone Co. at Malden, Ulster Co. N.Y.
Offices - 247 Broadway, N.Y. - 5th and Library Sts. and 30th and Chestnut Sts. 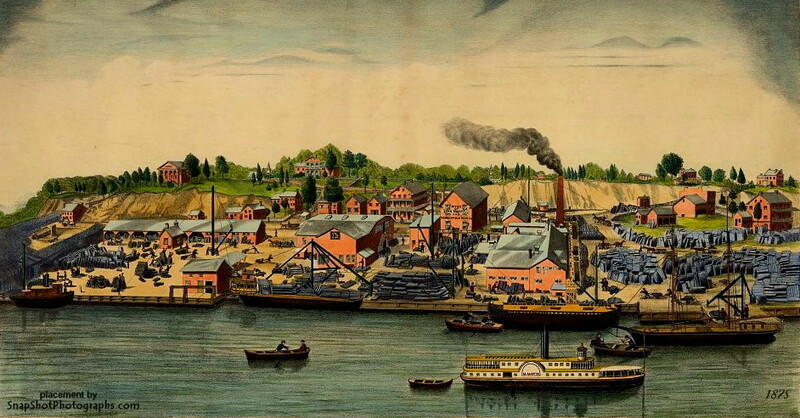 Philadelphia, PA."
"Print showing a view from across the Hudson River of the waterfront plant of John Maxwell's North River Blue Stone Works and the Bigelow Blue Stone Co. at Malden, New York; stacks of blue stone tiles, men working in the facilities yard, ships at dock, and a side wheeler paddle steamboat, "M. Martin", on the river." "The Bigelow Blue Stone Company employed around two hundred hands and have seven planning machines in operation for dressing stone. The motive power is a 100 horse-power engine. A large number of vessels are employed in transporting the stone to New York and other places. This Company shipped over $1,000,000 worth in 1870."